Mangazumbu mama minces no words. The rains have started. The scents are wonderful. 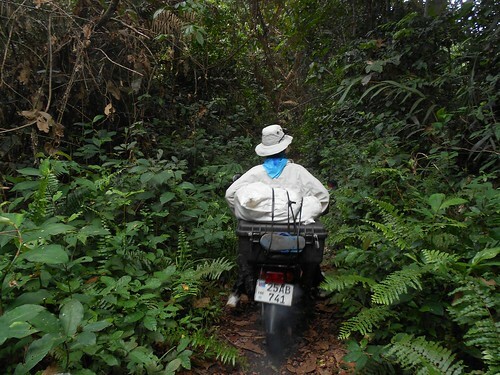 Hanging lianas brush fragrant flowers against our faces as the motorbikes speed along brief stretches of dry path. Mostly, though, we are walking ahead or behind the “motos” on our way to Mangazumbu. Half the time we are wading – often knee deep. The better to enjoy the smells, we tell ourselves. The first rains have opened red, yellow and white flowers in green canopies; each spreads a brief pocket of smell. Ghislain, my chauffeur, speeds me along a brief dry stretch. We are a rare event: Four motorbikes. Even bicycles are uncommon on this path from Mboka-ya-Lomango, south to Mangazumbu. 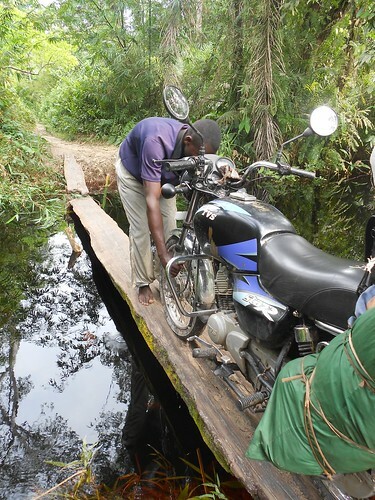 The bridges are so precarious that three of our motorbikes tumbled into a stream, each from a different bridge, as the drivers tried to balance them, one at a time, along a log, one foot in front of the other. Was this ever really a road? Is it even a path? The Belgians cut the road north in 1948. They used no machines: All hand labor and “fimbo” (rawhide whip) to make sure the work got done. The northern arrow is the crossroads savanna, Mboka-ya-Lomango; the second arrow is Ngondo and the southern arrow is Mangazumbu. Chief Sylvestra Loyowa of Mangazumbu was born in 1948 when Mangazumbu was first settled along the road. 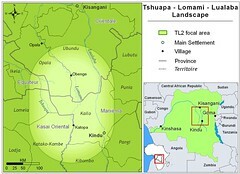 The Belgians had brought the original Mangazumbu village out from the headwaters of the NyamaTende, 20 km to the west. From 1948 until independence trucks came north along the colonial road to buy peanuts and rice. Even cotton, chief Loyowa tells me. Pamba, it was called. The last truck was in 1961. Chief Loyowa with his youngest wife and one of his sons. He has 38 children. We spent our first night along the Mangazumbu road at our new base camp in the village of Ngondo. The house and barraza at our new base in October. On this trip I was travelling with a Parks agent, Salumu of our TL2 project and Sat Ibata who works with the film-producing NGO, INCEF. This was Sat’s first trip and we hope the beginning of a long and fruitful collaboration with INCEF. The idea is to interview and film villagers as they tell their own stories about overhunting and the future of the forest. 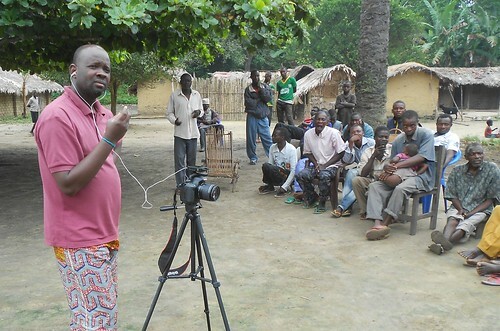 Sat asking questions in the village of Ngondo. 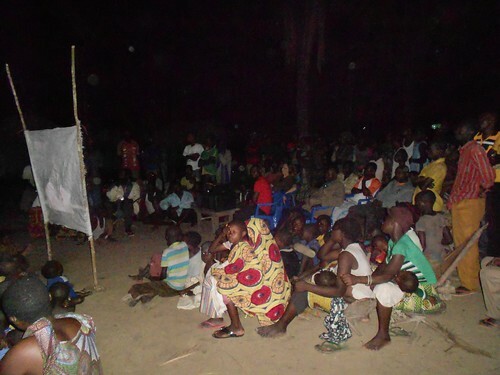 Locally made films can be taken from village to village. They give an effective voice to the most isolated people and bring villages with shared problems and no means of communication closer together. On this trip Sat had first interviews and showed films from previous projects, both about health and conservation. Mangazumbu was the last village we visited. Chief Loyowa has a special reason for talking to me. 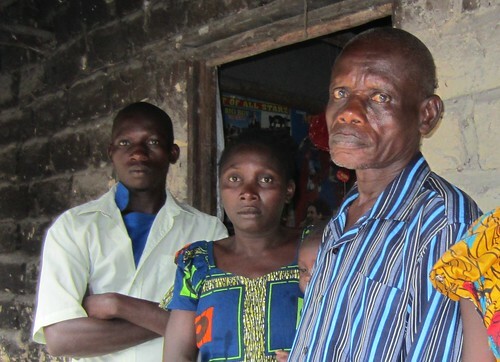 It was about his gun – his 12-caliber that fired at Boni when our workers were attacked. He sent Nene into the forest to hunt so he could send some of his 38 children to school. He was too old to do the hunting himself (not too old to have very young children), but, he assures me, he told Nene NOT to go into the park. The wall of chief Loyowa’s house has a poster of a very anglo-saxon Jesus next to a poster of very Congolese musicians and posters of international soccer players–a bit of the cosmopolitan along with dangling party ornaments. Lack of respect of the young for the old: Nene, with bold defiance, went into the park. At least that is how the Chief explained it to me. Now, his gun has been confiscated by the army. Nene – whose only punishment was from our own field staff – is nursing his wounds. And Chief Loyowa’s children are hanging around Kindu unable to go to school. There is no way we can help the chief right now. 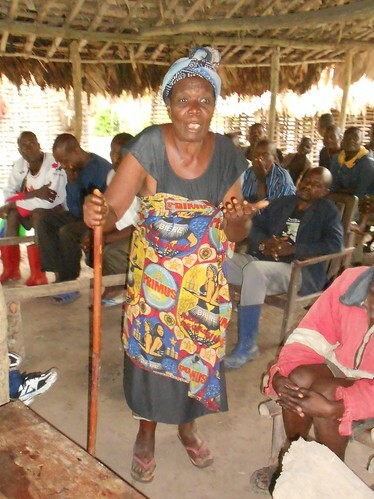 Hopefully – eventually – we will help Mangazumbu develop alternative ways to raise money. Move back to colonial sources of income – rice and peanuts! Maybe chickens and goats as well? But right now that road is a bit of a problem. 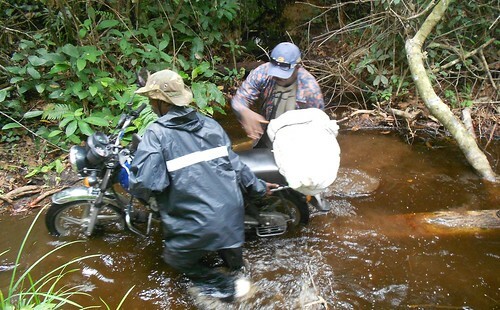 Ghislain and Salumu guide a moto over a submerged “bridge”. This entry was written by Terese Hart, posted on 2012-12-10 at 11:18 pm, filed under Bushmeat, community conservation, Indigenous peoples. Bookmark the permalink. Follow any comments here with the RSS feed for this post. Post a comment or leave a trackback: Trackback URL.